Gyms. You either love them or hate them. Some people can’t stand them, some have never even stepped foot inside one. Other people? They can’t get enough exercise and virtually live down the gym. Dwayne Johnson is one of those latter sorts. As you can probably tell from his physique! 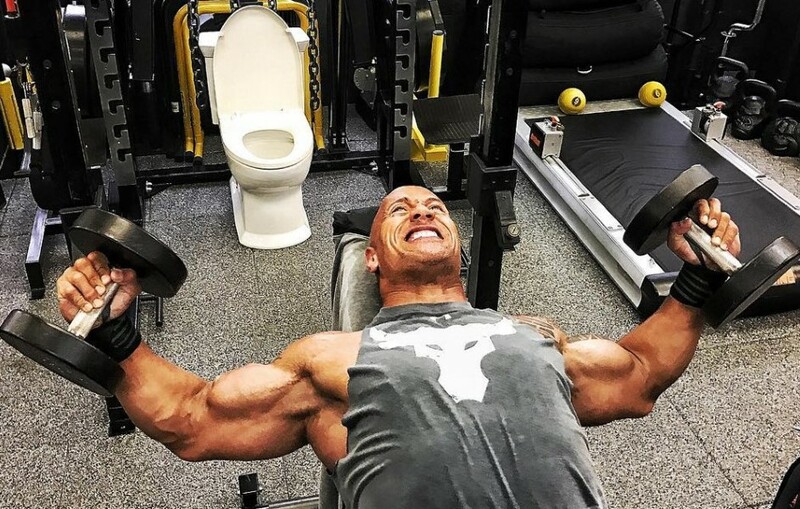 Followers of The Rock‘s Instagram feed noticed something weird this week… Right next to his squat rack there’s a TOILET! That’s right. Luckily – for all his puzzled followers – he explained just why. Thankfully it isn’t quite as disgusting a reason as it could have been. But it’s still pretty nasty. And check it – he STILL does the eyebrow thing! Can you smell that? The Rock is either cooking something or he’s just thrown up… What do you think? Cool idea? Or just gross?! This Obese Man Shows Off His Remarkable Transformation After Shedding Over 7 Stone! These Irish Dudes Get A Back, Crack, And Sack Wax… And It’s Just TOO FUNNY! Enormous ‘Lake Monster’ Washes Up On Shore In Manchester, England! Man Discovers Weird Woman Secretly Living In The Vents Of His Apartment! This Banned Bud Light Commercial Will Crack You Up!